A well made virtual reality project can be an amazing, mind-opening experience… for the person immersed within the headset. For onlookers on the other hand – those witnessing someone else having the time of their lives – the degree of amazement is often significantly reduced. The obstacle that many virtual reality developers (and companies that have commissioned their own VR projects) face, is how to effectively convey a VR experience without needing to rely on in-person demonstrations. Our team recently encountered this hurdle during the creation of our 2016/2017 production reel. We found that simply recording footage from the user’s point of view – while still compelling – didn’t quite capture the full power of the experience. We wanted people to actually see users immersed in the virtual worlds we’ve created. 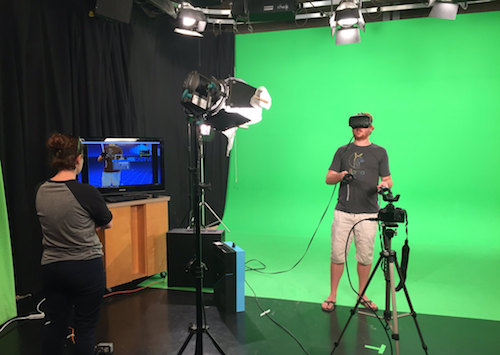 For this purpose, we decided to capture footage with the help of MixCast VR. While we ended up with a production reel that the entire team is very proud of – as a result of it being our first time going through the process, setting up MixCast VR and capturing our footage also involved small doses of roadblocks, back-tracking, and troubleshooting (that when paired with a tight time window on our studio rental, helped fuel exhilarating rushes of adrenaline)! To ensure that things run nice and smooth when we are ready to capture footage of our next project, we documented our MixCast VR process into a step-by-step checklist. If you are planning to record VR footage of your own, considering using MixCast VR, or are simply interested in learning more about what’s involved, we hope you’ll find this guide helpful. Grab the latest version of MixCast VR’s SDK here. Import it into your Unity project. Watch this video from the team behind MixCast VR for more. Make sure your green screen is wide enough to fully cover the camera’s field of view. If you intend to show room space or flying, the green screen should also cover the floor beneath the VR play space. Make sure your recording space is well lit. We rented out a local tv station’s green screen space, including full production lighting, to ensure the sharpest video quality possible. Tip: Wearing plain, dark clothing helps your actor stand out from the green screen. If your camera has an unclean HDMI out, you will need to remove any camera UI overlays to prevent them from cluttering your footage. We used a mid-range DSLR camera for our filming – and it worked great. Place your camera on a tripod at the edge of the VR play area, facing the green screen. Ensure the space between the lighthouses is centred in front of the green screen, and also that the lighthouses are not obstructing your shots. Create your VR room without having it extend beyond the width of your green screen. Keep in mind the room orientation in relation to the position of the camera when indicating where your monitor is (getting the dog to face the camera at a diagonal required much trial and error on our end). After everything else is setup, pair the tracker using the SteamVR > Config > Pair Controllers option. We discovered that you need to pair the tracker as the last step, so that it isn’t confused for one of the two primary controllers. Ensure that the camera’s entire field of view is within the green screen. Devices are listed in the drop-down menu located in the bottom left of MixCast VR Studio. By default, the first available device will be selected. The MixCast VR Studio already has FOV data for the most common cameras in its database – click the cloud icon to attempt automatically retrieving yours. If after clicking the cloud icon the numbers change, this worked, and you can move on. If not, you can search for your camera’s FOV information online. Use the MixCast VR Studio “chromakeying” options (also located in the bottom left) to key out your green screen. This step is done in VR – so put on the Vive headset. First, move the output display visible in VR to the position of your real-world camera. Then, use your controller to click the areas around the output display, and adjust the alignment until your virtual and physical controllers overlap each other. For more detail on this step, and the entire “setting up MixCast VR” phase, watch this how-to video made by BluePrint Reality. Have someone click the white “>>>” icon in the bottom right of the desktop window. You should now have a VR and Live Feed Composite visible on the desktop. Capture your footage using MixCast VR, or your desktop recording software of choice. We made all our recordings using Shadowplay. We also lost a fair bit of footage due to having left the mouse cursor in the middle of the screen – be sure to hide this, along with any desktop popups obstructing the video. Recording a virtual reality project with MixCast VR for the first time can seem like a complex process, but if you methodically follow these steps, and stay positive during first-attempt troubleshooting, the results can be very rewarding!